This image shows a digital terrain model of the crater investigated by the University of Arizona's Ali Bramson. Image released August 26, 2015. The amount of water on Mars has shifted dramatically over the eons because of the Red Planet's unstable obliquity — the degree to which the planet tilts on its axis of rotation. Unlike Earth, Mars does not have a large moon to keep it from wobbling, and so the direction its axis points wanders in a chaotic, unpredictable manner, regularly leading to ice ages. Learning more about past Martian climates and where its water once was "could help us understand if locations on Mars were once habitable," study lead author Ali Bramson, a planetary scientist at the University of Arizona in Tucson, told Space.com. When a crater forms because of a cosmic impact, the shock wave from the collision can push aside weaker materials more easily than strong ones. "The result is terracing at the interface between the weaker and stronger materials," Bramson said in a statement. 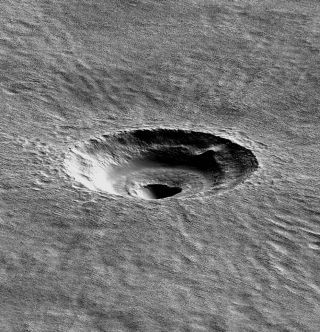 Terraced craters of the size the researchers saw are virtually unknown outside of this area of Mars, Bramson said. However, all 187 craters the researchers studied have terraces, "which indicates something weird is going on in the subsurface," study co-author Shane Byrne, also of the University of Arizona, said in the same statement. The ice the scientists found measures 130 feet (40 m) thick and lies just beneath the dirt, or regolith, or Mars. Such an extensive ice sheet had never been seen at these latitudes before, study team members said. In addition, this ice sheet is probably tens of millions of years old. "We believe this ice to be a relic of a past climate when snowfall could occur at these latitudes," Bramson said. The researchers will now model the behavior of the ice at Arcadia Planitia to learn more about how it it could have stayed preserved for so long, Bramson said. She and her colleagues detailed their findings online Aug. 26 in the journal Geophysical Research Letters.